Four members Salford Red Devils Foundation Staff members have successfully completed the brand new Wheelchair Rugby League Coaching Qualification. The Foundations team of expert community coaches deliver thousands of hours of engagement at schools and community clubs across the Salford, Trafford, Bury and Manchester areas each year, and the Foundation have expanded into Wheelchair Rugby, with delivering starting in schools in 2016. 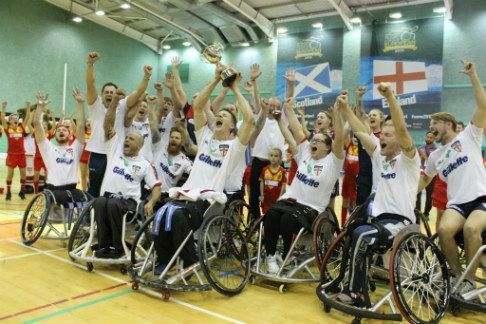 Moving forwards the Foundation have plans to continue to develop Wheelchair Rugby League in the local area, and the skills and insights gained on the coaching course will enable the Foundation to provide coaching of the highest quality. Wheelchair Rugby League is a rare example of a sport that enables both disabled and able-bodied participants to play and compete on a level playing, and the sport is growing at a rapid rate in the UK.